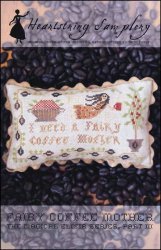 Fairy Coffee Mother [G1972] - $10.00 : Yarn Tree, Your wholesale source for cross stitch supplies. Cross stitch pattern by Heartstring Samplery. Do you love coffee? If you answered yes, then "Fairy Coffee Mother," is the design for you! This design features a fairy mother with her cup of coffee. The saying, "I need a fairy coffee mother," is stitched below. A coffee bean tree is stitched next to the saying. To complete this design, a coffee bean border is stitched. Stitch count 110 x 62. Stitched on R & R Reproductions 40ct. Patriot's Brew #2330.